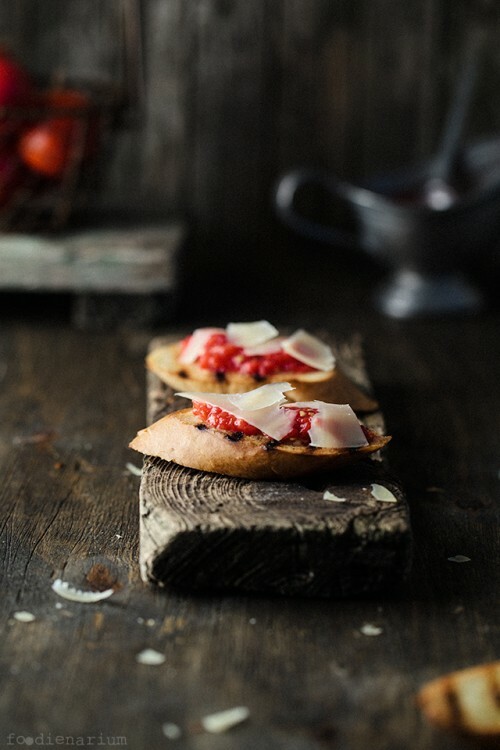 Crostini turned out to be a great appetizer which is not only easy to cook but can be cooked every time differently. There is a plenty of recipes for this classic Italian snack and it can be served both with cold and warm drinks. They are especially good as a snack with a glass of wine. In honor of the delicious crostini my wife and I decided to have fun and cook different variations thereof during a month. To be more correct, not only crostini, but also bruschetta. Unfortunately, being far from the Italians, we are not always able to assess where the boundary between these two meals is. The first step is preparing the base, i.e frying bread. To do this, spread butter on it and fry in a well-heated grill pan for 2-3 minutes on each side. Right after take off from the pan and rub each slice with a clove of garlic. Now prepare the filling. It’s all very simple. Grate the tomato on a coarse grater and with a paring knife make a few shavings of parmesan. 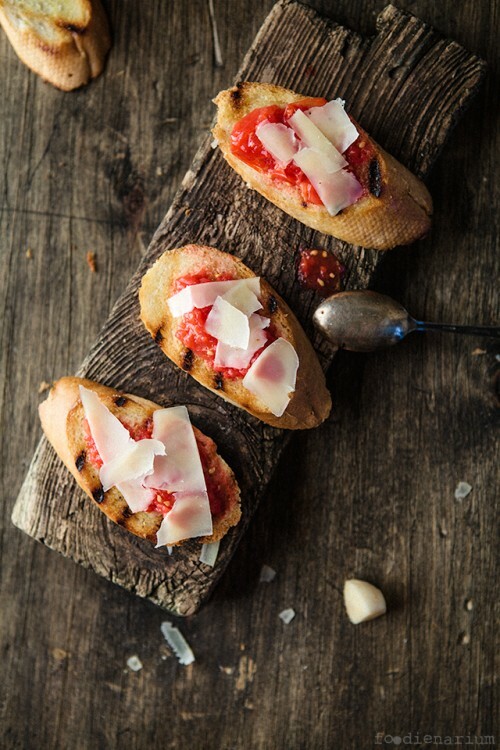 Spread a pair of teaspoons of tomato and several pieces of parmesan on each slice of bread and immediately serve. Crostini should soak up a bit of tomato filling, but not soften and stay crunchy.